The Abbey Church at Worth in West Sussex was built in 1966 and consecrated for worship in 1974. It is has the largest capacity of any church in Sussex seating up to 900 people and the monks gather 6 times daily to pray. The grade II* listed church was designed by the Architect Frances Pollen and is constructed from insitu concrete with a felt roof. To achieve the large open space he used a bridge building technique never before used in a church. It is considered by many to be the finest example of 1960s modernist architecture in Britain. Kier were awarded the year long refurbishment contract and we secured the subcontract to restore both the internal and external concrete. Whilst our works were carried out, other trades completed lowering of the floor to the choir area, upgrading lighting and sound systems, alterations to M & E, re-roofing and window replacement. External repairs were carried out to all reinforced concrete, with preparation by dry ice blasting to remove old coatings from the ribbed surfaces and high-pressure water jetting to prepare uncoated smooth surfaces. The prepared concrete was treated using a migrating corrosion inhibitor, followed by the application of a pigmented, elastomeric coating. 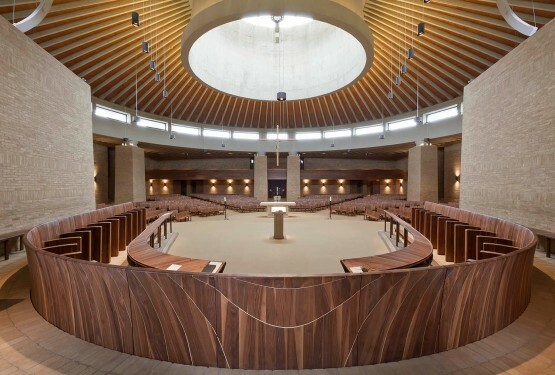 All products were manufactured by Sika Ltd.
Internally, the reinforced concrete ribs which support the roof above, together with the two chapel areas, were prepared and treated using a micro-porous pigmented coating, providing a uniform finish to otherwise patchy surfaces. Products for this element of the works were manufactured by Keim Mineral Paints Ltd. The refurbishment of the church was successfully completed in time for reopening on Pentecost Sunday as planned.